We’re in full swing when-is-this-kid-going-to-take-his-first-steps mode around our house. And it isn’t just his mother and I who are excited about Noah learning to walk…. I can tell by the look on Noah’s face that he really wants to take take those first steps. But he isn’t quite there…yet. On the other hand, he’s one of the fastest inchworm-ers I’ve ever seen! These feet were made for walking, and that’s just what they’ll do…..
It’s amazing to see how far he’s come since he first started walking on the treadmill. The first few times he put his little feet on the treadmill he didn’t want to do anything. (Or maybe he didn’t know what to do?) But as time went on, and he became more comfortable on the treadmill, he’s started to put one of his tiny feet in front of the other! I’m so proud of this little boy! And to be honest, I really don’t care how long it takes him to learn to walk. I’m just enjoying being his dad and getting a front row seat to seeing his grow up. If anything I wish I could slow it down, not speed it up. What you don’t know, won’t hurt you…..
Noah’s our first and only son (at least at the time of this writing) and I have no idea what the typical age range is for when a child should start walking. To be honest if I didn’t have friends with young kids I don’t think I’d even know that our son had developmental delays. I don’t know if that’s a good thing, or a bad thing, but I don’t mind. Me: Is it normal for a 12 month old to wear 3-6 month clothes? Want to learn more about how treadmills help children learn to walk? If you’re interested in learning more about treadmill training for children with Down syndrome Dr. Ulrich, who pretty much invented treadmill training for babies with Down syndrome, gave us permission to make available the protocol for treadmill training as a free download. I’d highly suggest checking it out, and even showing it to your child’s physical therapist in case they aren’t aware of it. Has your child ever used a treadmill in physical therapy? Has your therapist discussed this with you as a option for your child? Leave a comment below and tell us about your experience. ryan doesnt wear the size other kids his age wear he was a premie n 4 lbs so hes been small his whole life it use to bother me but hey its who he is he will get there when he gets there . one of these days he will go thru a growing spurt n then he will be in the size hes suppose to be in but till then oh well we get smaller clothes . noah will get to where hes suppose to be one day it may take him longer to get there n when he does start walking oh watch out momma n daddy cuss you wont have time to sit n relax he will have you guys running all the time . Gabriel is 1year3mths but he still fits into 4-6 mths clothes.yup,he’s small but super cute. Treadmill therapy sounds n looks really good but here in Tokyo we do not use it for therapy.I think I’m gonna ask our therapist why. Looks like a great therapy, the type that doesn’t really seem like therapy! Dont worry about the clothes or size, my son is lighter and smaller than his NT 3 years younger sibling. Clever boy, Keir rocks back on his heels and lifts his toes so the balance really isn’t there yet. And just stay with him, he’ll get there. How old is your boy if you don’t mind me asking? I’m a pediatric PT and have been using treadmill training when I have families that have the resources to buy or borrow one! One thing I have found helpful since we don’t have any of the suspension equipment like they might in clinics is use a harness called the “Juppy”. I’ve never been a big fan of harnesses for walking but this one sure helps for treadmill training. I can hold the child up with the harness and save my back as well as allowing the child to have as much weight on their feet that they can tolerate. Easy for parents to carry over as well! I enjoy your website and the wonderful information you give families! Noah is a very lucky little guy – Keep up the great work! Kate, thanks for the kind words, and for all the great work you do! Do you work with a lot of children with special needs? I’m with Early Childhood Intervention here in the Metroplex so that’s all I do! Rick, this is great news that Noah took a couple of steps at 12 months of age. 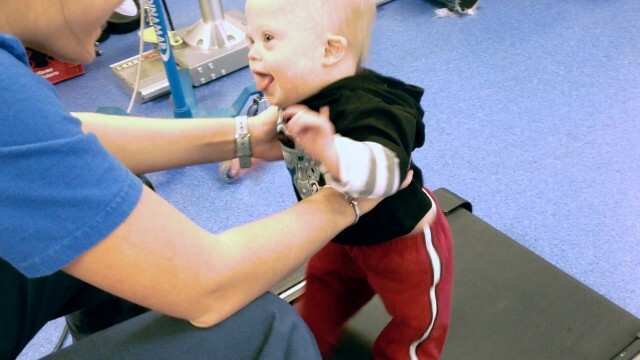 In both of our randomized trials involving treadmill training and infants with Down syndrome, the earliest we had infants walking was 15 months. To answer one of your questions on when an infant with Down syndrome typically walks, I always cite a Canadian study of infants with Down syndrome all of whom were receiving early intervention services and they reported that only 40% walked by 24 months of age. The majority walked between 24-28 months. If you have read several of our treadmill studies, you might recall that we only enrolled infants when they could take a few steps while supported on the treadmill which was around 10-11 months. We never enrolled infants as young as Noah was when you and your wife began treadmill training. This is an excellent case study of what can happen when beginning treadmill training at 6 months. You pushed the envelope which is great. We always felt it was important for parents to see that their infant could take a few treadmill steps before we asked them to do this 5 days each week, 8-10 minutes each day, until their child could walk. We wanted to maximize parent motivation given how busy they all our. One thing I would change about the procedures in both of our treadmill training randomized trials was NOT to stop treadmill training when the child could take 3 independent steps over the floor. I would continue training until the child could walk across the room. The reason we stopped at three steps was the federal funding was only for 3 years. As you could imagine, we had 30 infants enrolled in each study and continued to follow them until all infants could walk. As a researcher, we had no good idea when all 30 infants would walk. 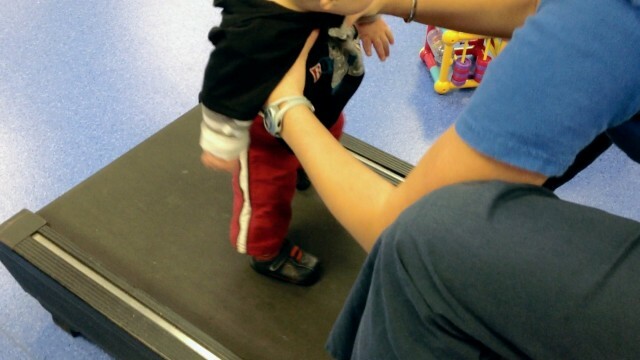 We did believe the infants receiving the treadmill training would walk sooner than the control group of infants. The other important result that we discovered in our second treadmill study was that infants with Down syndrome who walked earlier were also more physically active when they were 3. Walking is important for many reasons and now we know that it also influences their level of physical activity which is very important for reducing weight gain. I have to think back to when my older son did things(he took his first steps at 9 mths), but every child is different. I am so happy with where Colton(just 18 mths) is at right now with gross motor skills. He is crawling well, pulling up on everything, and taking risks, pushing chairs around. So awesome to see Noah’s great balance! Colton is comfortably in a 12 month size.. but can still fit in 9 mth stuff. That’s great, it sounds like he is doing awesome! I’m glad Noah’s making progress 🙂 I didn’t know Down Syndrome affected mobility thanks for educating me! Hey no problem at all, thanks for checking out our story. It’s always fun to share with others as we learn. That’s fun that your daughter is so active. Does she have any siblings? What’s she up to these days? This is Joshua, my grandson he didn’t start walking til almost 2 years old now he is unstoppable he will be 3 on Dec. 14 and was in 3-6 month clothes forever,even now he is in 12-18 month pants and 2-3 in shirts. It’s like he just started growing over night.